Lamb Chops (Mutton Chops) ! what can I write about Lamb Chops when I am feeling hungry even by looking at the above picture :). 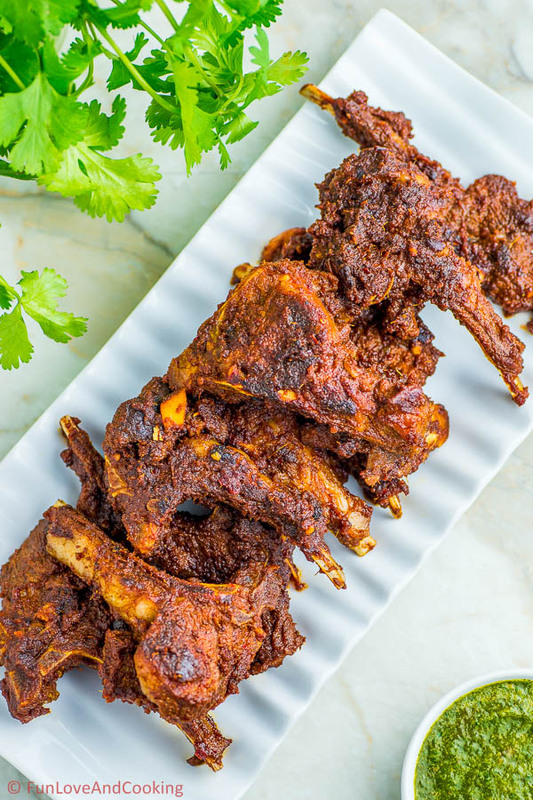 If you never had Lamb Chops then you must try this recipe and you will be not able to forget about it easily.Believe me or not, but this was the best Lamb dish I ever had. There is only one tips to make the Lamb Chops in right way and that is patience and slow cooking without any water. The below picture has been taken after the Lamb was added. This is one of the best recipe and dish I have made. I hope will also like it very much, in case you have any additional questions please feel free to reach out to us. Soak the dry whole red chili for few hours and then make a paste. Wash the Coriander/Cilantro leaves and then make a paste using the blender. Take a bowl, add Yogurt, Ginger & Garlic Paste, Red Chili Paste, Coriander/Cilantro leaf Paste,Cumin & Coriander Power,Red Chili Power,Chaat Masala Powder (Options), Red Wine Vinegar,Salt and mix everything together. Now add the Lambs one by one to this mix and marinate for at least 4 Hours. Cover the bowl and keep it in refrigerator. Once the marination is over, take a large skillet in low-medium flame and add the oil. Once the oil is hot add Whole Black Pepper,Cinnamon,Cardamom and Cloves. When the aroma starts coming add the Onion Paste and stir for 2-3 mins. Add the marinated Lambs (Keep extra marination liquid aside) to the skillet and cook for 5-6 mins. The Lamb has to be cooked very slowly for a long duration without any water. So you need to make sure the Lamb does not get burned. Reduce the flame to simmer and cover the skillet with a lid. Let the Lamb cook for another 30-45 mins in simmer.In between in every 5 mins turn the Lamb pieces so that both side will get cooked. After 30-45 mins when the masala will start getting dry, add the extra marinated liquid in small amount in every 5 mins and cook the Lamb again for 30-45 mins. Now add the Tomato Puree and mix well. Increase the heat to low and cook for another 15 mins with the lid on the skillet. Check and turn the Lamb Pieces in every 3-5 mins. By now all the water from marination liquid, Onion paste & Tomato Puree must have been evaporated and the masala should have made a coating on the Lamb. Add 1 Teaspoon Garam Masala Powder, Chaat Masala Power and mix them well. Cook for another 5-10 mins and your Lamb Chops should be ready. Serve the Lamb Chops hot with Naan. You can marinate the Lamb overnight, however I had marinated only for 4 Hours. Sometimes the Lamb takes more time to be cooked, in case the Lamb is not cooked for you properly, then keep it in simmer/low flame for more duration. It is not advisable to add any water however in case your Lamb is getting burned, sprinkle little bit of water. Use a good non-stick skillet to make this recipe. The Lamb Chops needs lots of patience, you can't make it quickly. This is Fantastic! a great savory way to cook it and its a quick fix too!